This is my "Six-Five". 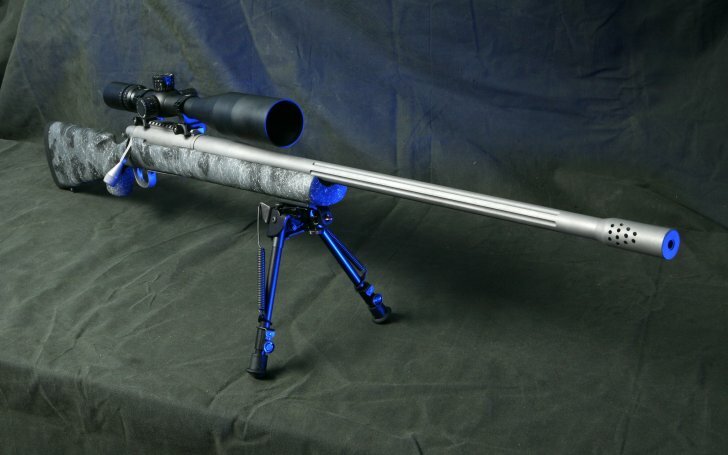 This precision rifle was made for me by Lou Andrews. It is chambered in a wildcat cartridge, the 6.5mm WSM. This is the platform on which I will learn about long-range shooting. It should be able to take me to 1200 yards, and possibly to 1600 yards. It is built on a Nesika action. It has a right-hand bolt with a left-hand ejection port. A large tactical bolt handle, and a Jewell trigger. The barrel is a Broughton 5C barrel in fluted stainless steel, 27-1/2" long. It is button rifled with five grooves and canted lands. According to Lou, this is the barrel that has been dominating the 1000 yard competitions with 6.5mm bullets. 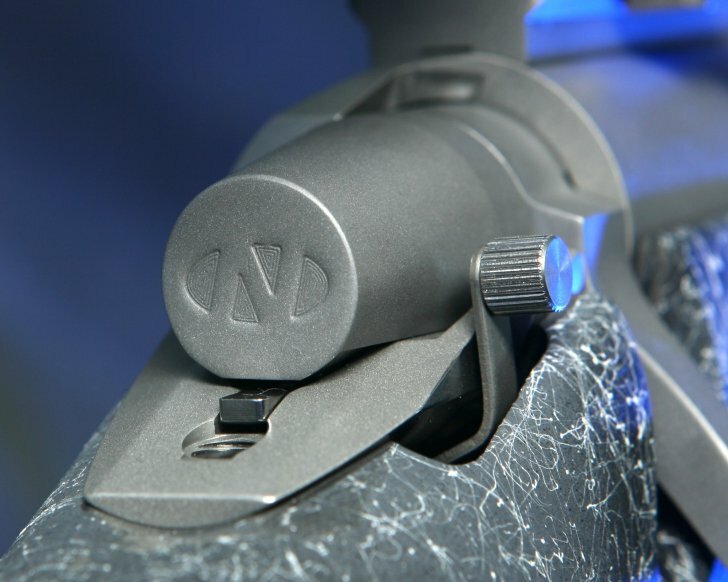 The barrel is topped with one of Lou's highly effective muzzle brakes. 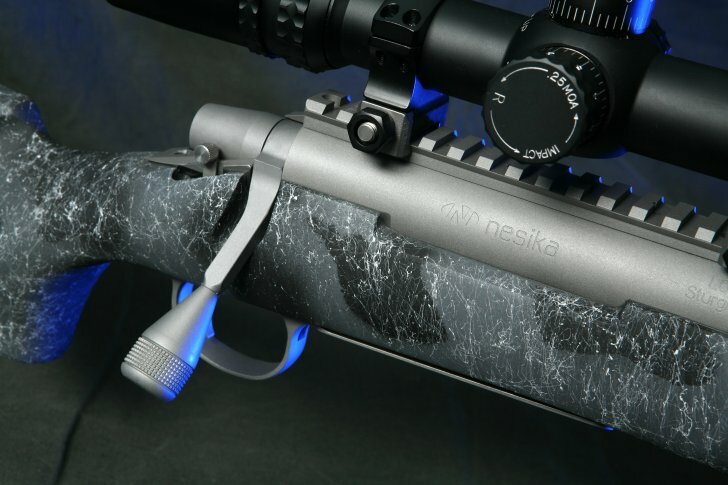 The stock is an H-S Precision tactical stock, model PST05F with the Urban Camo finish. It is fiberglass with a full-length bedding block. 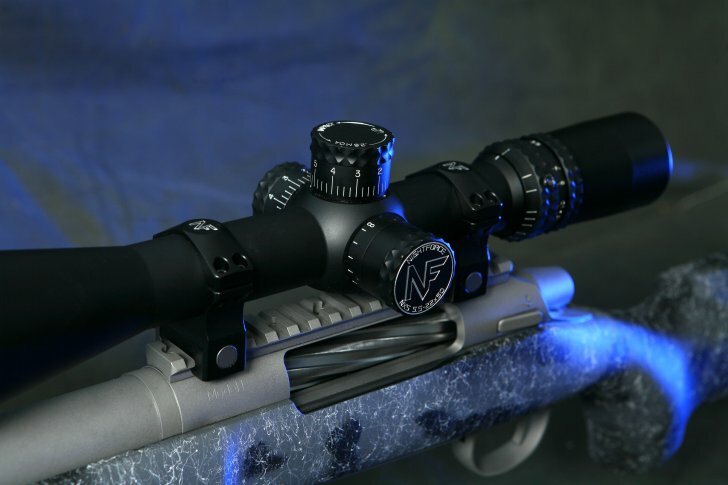 The scope is a Nightforce NXS 5.5-22x50mm scope with the R2 reticle. There is still a little work remaining on this thing. Detachable Box Magazine – The original plan was to use a detachable box magazine made by H-S Precision (AP209-4). However, they have a ridiculous backorder situation. No one else really makes a suitable replacement. We currently have a center-feed internal box magazine, but it only feeds so well, and it looks like crap. I am thinking about learning how to make the magazine. Cabela's has a Kwik Klip conversion kit, but it is steel and aluminum. Whoa! Brownells appears to have it in stock ... for $308. The stock number I want is 393-210-721. It's too bad I'm broke right now. Since this is a wildcat cartridge, I have to form brass for it. We start with 270 WSM and neck it down. We used Redding Type S neck sizing dies, starting with a .305 bushing, then .301, and then (I believe) a .295 bushing. The diameter of the chamber's neck is .292, so we set up the neck turner to cut the necks so that the neck diameter of a loaded cartridge was .290 (or .2896, actually). I should probably get a drawing of the reamer dimensions from Lou for my reference. The things I have learned from Lou about accuracy the past couple of days has been quite instructive. I will have to apply some of this knowledge to my other handloading. Just sorting brass by weight and by neck thickness could make a measurable difference in my hand loads. "Here is an illustration of the above set up for an NXS on 22 power. 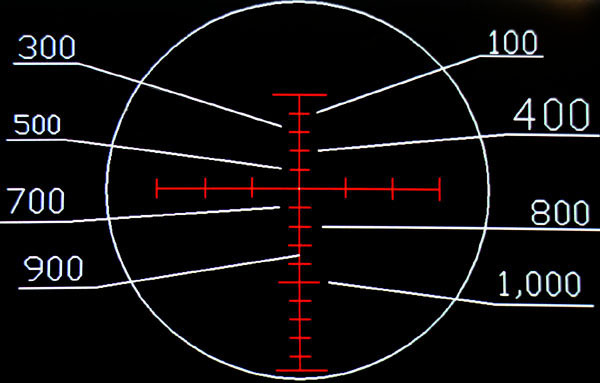 The main crosshair is dead zeroed at 600 yards. Notice the Longer Tic just above the 100 yard Tic mark, the very top one. This tick mark is useful when shooting straight up or down (Sky Scraper or Cliff)." The elevation tic marks are 2 MOA apart (at full power) and the windage tic marks are 5 MOA apart. The scope is theoretically zeroed at 600 yards for my 123 grain Scenar load. In practice, it is zeroed at 100 yards using the 4th tic up.